Dr. Makhija earned her B.A. in Chemistry from Cornell University and her medical degree from the University of Alabama at Birmingham. She completed her obstetrics and gynecology residency at the University of Louisville Hospital and a fellowship in gynecologic oncology at Memorial Sloan-Kettering Cancer Center in New York. She received her executive MBA from Emory’s Goizueta Business School. 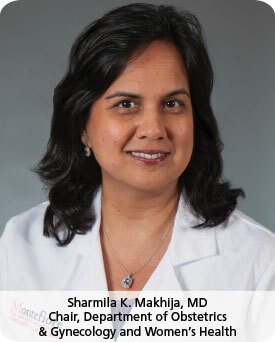 Dr. Makhija has published and lectured nationally and internationally on developmental therapeutics, such as gene therapy and monoclonal antibody therapy for the treatment of ovarian cancer, for which she received NIH funding as a Women’s Reproductive Health Research Scholar. She has been the Primary Investigator or Co-Primary Investigator for 15 translational/clinical grants and protocols for the NIH, NCI and pharmaceutical companies, including the HPV vaccine trials. She has served as a reviewer for the Department of Defense and the NIH Clinical Oncology Study Section. Dr. Makhija established a NCI cooperative trial site at Tata Hospital in Mumbai, India to bring cervical cancer trials to patients who most needed access to the latest therapies. She has continued her work in India and serves as the Women’s Health Co-Chair for the upcoming Global Healthcare Summit in New Delhi, India in 2016, sponsored by the AAPI (American Association of Physicians of Indian Origin) with a focus on Maternal and Infant Mortality. Dr. Makhija is a graduate of Executive Leadership in Academic Medicine (ELAM), serves on their advisory board and was an elected representative for AAMC CFAS (American Association of Medical Colleges, Council of Faculty and Academic Societies) while at the University of Louisville. She has served as a board of director member of numerous local, state and national organizations including the University of Louisville Medical Center, KMRRRG malpractice, KY Medicaid (Passport). She currently serves on Women’s Voices for Change, the Foundation for Women’s Cancers and the Indo-American Cancer Association. Dr. Makhija has been listed as a “Top Doctor in America” since 2008. To support women's health at Montefiore, please complete the donation form below. Thank you for your interest in and support of Montefiore.